Updated: The cautionary tales around broadband caps are trickling in, with the latest coming from André Vrignaud, who detailed in a blog post his experience of being cut off from Comcast’s (s cmcsa) Internet service after going over the company’s 250 GB per month broadband cap two months in a row. He’s justifiably outraged because he now has no Internet and he didn’t really seem to have a lot of options offered before he was cut off. My colleague Mathew experienced a similar issue with his cap, and I suspect the two stories have something in common — the cloud. Or rather, backups of huge files. After Mathew was forced to become a network cop and figure out why he was going so far over his monthly bandwidth allotment of 95 GB per month, it took him about a month to determine the culprit — an inappropriately configured cloud-backup service with Amazon. Judging from Vrignaud’s story, he may have hit his cap doing backups as well, since he describes backing up RAW image files and FLAC audio files to a recently purchased Carbonite subscription. He also describes streaming Netflix movies and Pandora in a home with multiple roommates, as well as working from home on digital files. We’ve driven this point home before in a multitude of posts about how caps harm innovation and how they will catch more and more users over time. But in reading this case and talking to Charlie Douglas, a Comcast spokesman, several other issues around caps came up. Issues that are more important as more users have caps. I’ve long appreciated that Comcast’s cap was pretty fair: It discloses the limits, it has a reasonable network management plan, it offers a meter and — most importantly — the cable provider says that as the median usage increases on its network, it will raise that cap. However, since the cap was implemented in 2008, when Comcast had a median usage of between 2 and 4 GB per month across its entire network, the median usage has risen only to between 4 GB and 6 GB per month. The cap hasn’t increased by a commensurate amount and Douglas was adamant in pointing out that using 250 GB a month was way above normal usage. As people adopt cloud services, those providers don’t think about broadband: Short of Netflix taking up the crusade against caps, we don’t see Amazon, Mozy (s emc) or Carbonite helping to educate users about how their services and settings for backups might influence their broadband caps. I don’t think they should have to get into this education campaign in an ideal world, but for now, we live in a world with caps. Helping customers avoid getting kicked offline or charged extra for overages is good customer service. Residential service isn’t clear-cut anymore: When looking at this guy’s usage, it’s possible that he was using his connection for work, which prompted Douglas to point out that he had signed up for a residential connection. This is a common ISP response when people bemoan their limited caps in the context of uploading files or sharing videos as part of their jobs. But when I asked if Vrignaud would even be eligible for a business connection, Douglas didn’t know. He said that the business people would want to make sure the connection was for a legitimate business which means they would ask for a Tax ID number or some other verification. While a freelancer might have that, a remote worker wouldn’t and would then have to get their employer involved in getting a connection. In some cases, although not necessarily in this one, folks in residential areas cannot even get a business connection. Update: Vrignaud said in a conversation and in his latest blog post that he is trying to get a business connection, but it doesn’t look good. In my many stories about broadband caps these issues haven’t really come up very often, but I think that’s about to change. And it leaves me with more questions than answers. As residential broadband becomes essential for how we do our jobs, as well as for consumer entertainment and other web-based products, it’s time for big companies to start taking a hard look at how ISPs policies will affect their employees and their ability to offer services and perhaps give a call to their favorite lobbyist. If left unchecked, this won’t stay a consumer issue for very long. As for Comcast, when I asked if customers were getting caught in its cap more often, Douglas replied,”We don’t disclose, but logically people are doing more online and have more devices. Far less than 1 percent of our customers should ever get a call from us.” That’s not a real answer, but with 17.4 million broadband subscribers it sounds like we should expect to hear more stories on this issue in the coming months — but fewer than 174,000 of them. Its Basically the ISPs to blame, if they charge you for a certain service, it is upto them that they yield. I strongly suspect that Telecom companies lose money with heavy Hulu-netflix- Webcam on 4 hours a day power user households. They make money with folks who are using broadband in a much more limited way. They might have to start charging extra ordinary amounts of money, for the charge more, do not have caps to work, or the caps would have to be much lower. Boy, this is timely for me. For an hour, I was dealing with this outage. The first rep treated it like a tech support call for twenty minutes, then cold-transferred me to their security team- which put me on hold for ten minutes, then hung up. It took two more calls to get the issue resolved. I understand that I agreed to a cap, and that I went over the cap. But Comcast made it nearly impossible to resolve. And that’s why I switched this morning to Verizon FiOS. By the way, I did ask about business service. I was told that the only thing that I could get would be enterprise-level service, which would run thousands a month. I’d be willing to pay more for a service aimed at my needs, but it doesn’t appear that they offer such a service. Pity. Well, gotta say, youre lucky to have more than 1 high speed option. I would sign up for FiOS in a second if I could. You’re not kidding, especially after I talked to Comcast’s “executive customer service”. I had tweeted about my situation, and @ComcastBill responded, asking for an email about what happened. I wrote a detailed, polite email about what was going on. Oh dear, the sky is falling! The bottom line is Comcast’s policies are stupid. Not because there is a cap, but because there is apparently no way to buy your way beyond the cap. I know some of you find this unreasonable. Quite frankly your arguments are entirely unpersuasive. The fact of the matter is much of the world is priced based on usage: gasoline, electric power, food consumed, shoes worn out, airline trips taken, cell phone minutes, et al. It's just not unreasonable for ISPs to ask their hungriest customers to pay a bit more. Sorry. What is unreasonable is for ISP to cut off their hungriest customers without offering them an easy, fully comprehensible method for paying their freight. No cell phone company does something this stupid. As I said, Uverse has figured this out as well. It's really unclear why Comcast can't figure it out, too. This is a strong point. Comcast’s response to overusage is “bad boy, we don’t want your money anymore”, when it should be “hey, you owe us a little bit more for this month”. There’s a class of customers that would be very happy to embrace this solution. And we’re being told to go away. It’s one of the strangest marketing decisions I’ve ever seen. Well, with the exception of cell phone minutes, everything else listed is a tangible consumable – power must be generated, food grown/prepared, shoes manufactured, and gasoline pumped, bought, shipped, and refined. So of course its priced based on usage. Data just passes through and is it tremendously cheap for Comcast to do so. Should the person who watches television 10 hours a day par more than the person who watches 5? But it didn’t used to be like this. I used my connection uncapped and I could download whatever I wanted whenever I wanted for years until 2008 when they imposed caps. Things changed. They were not like this before. Why do we have to continue to accept bandwidth constraints. They don’t exist in smaller countries like Korea and European countries, so I would expect that US cities should be able to keep up. Rural America should be getting the same 10Mb/sec internet I’ve had for the last 8 years and I should be getting 40Mb. And not 40Mb like “PowerBoost” or whatever scam Comcast uses to advertise a higher speed and continue to sell the same service. Show us your books. You are clearly in a position to break out the numbers and enlighten us. Given the explosive growth of apps, streaming, and other online services, it is no surprise that consumer bandwidth consumption has been rising. 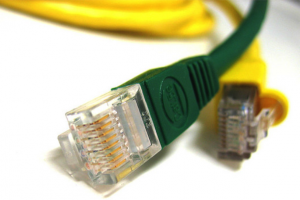 ISPs have failed to keep pace with their investment in their networks. Instead, they prefer to “control” costs and simply impose caps as a cheaper alternative. ISPs are essentially monopolists and as any basic econ course will teach you, monopolistic firms are characterized by two things: overcharging consumers (because they can) and undersupplying the market. If ISPs really can’t figure out how to make a profit and at the same time offer quality high speed internet, then maybe its time some competition was introduced into this market. If they can’t do it, I’m convinced that the market will produce a firm innovative enough to achieve this. There are some barriers to the introduction of last mile competitors. A simple but troublesome item is the scarcity of space on existing telephone poles. The communications corridor on the pole is narrow and in most cases already contains pots telco and incumbent cable-tv. Sometimes traffic light coordination or other municipal wiring is in place. In a few places FTTx facilities may be present. To free up space for a new carrier’s cables, existing occupants are asked to tidy-up their own existing cables. Most drag their feet tp slow the introduction of competition to the market. Partnering with the electric utility itself can allow access to other regions on the pole, but you have now gone to bed with (typically) the king of reactionary luddites. Underground construction is very expensive, especially drops to the home. Some percentage of construction is guaranteed to damage gas or other U/G utilities, causing big repair costs (raising your average cost per home). In home wiring installation is not only costly, but invariably looks bad because in-wall snaking of wires is astronomically labor intensive (costly!). Installing fiber is absolutely the right thing for the consumer and for the country. But it is very expensive. Hats off to Seidenberg for making a go of it; and shame on SBC (dba AT&T) for cheaping-out with VDSL crap. Come on, man. If the ISPs can’t find the money you and I have been paying them, you should be mad at them too. Shouldn’t the cost of the service they provide decrease overtime with improvements to technology? So they should have money to invest in newer technology since they’ve provided the same service for quite some time now. They should take the money and provide the same service, never increasing the bandwidth caps, and never investing in new technology even as the demand for their product increases as people rely more and more on the cloud? How does that help your or them? You clearly dont understand what you are talking about. AndrÃ© has a 15/3 connection. I assume it is a 15/3Mbps instead of MBps. This translates into a 1.8/0.38MBps connection. 4,860GB/mo 24/7 for 30 days. 4.8TB/month is alot of data! But it is kind of what you are sold on when they sell you a 15/3 connection, isn’t it? You expect to use it as you see fit for the 30 day period. With their 250 GB/mo data cap, that means that Comcast is expecting him to use his connection at full speed for only 250/4,860 = 5.14% of the time. That’s not really fair is it? Who could do all that kind downloading? He must be a pirate! Or, he is doing some uploading too. Hmmm…. None of Comcast’s numbers in the table above seem to consider the Ethernet Frame overhead (upwards of 6.2%), Comcast’s SNMP polls and modem health checks, TCP Retransmit errors, and SSL overheads, to name a few of the data parasites. They must be using simple math like I did. Unfortunately, they are billing for 250GB/mo but only delivering ~235GB of data when you back out the overheads. And they get cranky with their customers because they are going over the “Cap”. Why aren’t customers getting cranky that they are not getting 250GB of data and that if they only use 50GB on month that they don’t get a credit or roll over. Oh yeah, it is an olygopoly. Sorry about the typos: even with a slide out keyboard, composition on a mobile phone remains unwieldy. I don’t have any sympathy for the telecom providers. Most have defered network investment as long as possible. Purchase of capacity metering systems is simply cheaper than investing in expansion of capacity. Maximizing bonus checks trumps all other priorities. Citizens rely on the Internet as a utility; most telecom providers view it as a lucrative luxury service that they can gouge consumera for. The real evil here is that bytes used have little to do with fairness (or imposing backpressure on users to defer capacity expansion). PEAK USAGE BITS PER SECOND rates are what counts. Long slow trickles can/ ove huge byte count volumes but don’t necessarily require infrastructure expansion. Simultaneous usage by multiple customers sharing a scarce resource pool (docsis channel pair or ISP’s uplink transit circuits) are what lead to congestion, latency and packet loss. It’s not bytes-per-month that directly affects quality of service, it is BITS PER SECOND, and notably bits per second during timee periods where a lot of other users are vying for the shared (scarce) resource. Transit providers have long offered metered-use ciircuits. BUT, the billing is based on peak bits per second rate observed on the circuit over the monthly billing period. They use five minute observation periods: calculate the bytes sent over the five minutes and divide by 300 seconds, this yields the average bps rate during that five minute interval. They collect this for each consecutive five minute period all month long. While the five minuute averaging can help a lot to mask very short duration high bps peaks, the transit czrriers provide an additional level of forgiveness to the customer! They sort all the five minute average bps measurements taken on the line over the month AND THEN IGNORE THE TOP 5%!! This is a relatively customer friendly billing system, and one which actually relates to usage of the underlying shared use resources. What the transit providers don’t take into account is time of day. In their business, traffic flows occur all around the clock, so time of day peak avoidance cannot be obtained. They build capacity to ensure offered load is conveyed. Period! In the case of most professional, credible big name transit providers, there is (essentially) no packet loss inside their core. They build capacity to deliver the offered load. Last mile providers see heavy interactive use during narrow time windows. If the goal is to improve the customer visible experience, then they should measure BPS rates, just like the transit providers, and preferentially penalize high bps usage during times of the day when live-user usage is greatest. High bps rates during unpopular times of the day should be forgiven (even encouraged). UNDER NO CIRCUMSTANCES SHOULD TOTAL BYTES CONSUMED BE A FACTOR IN BILLING. Byte counts and byte caps are just gouging by the sleazy last mile provider. In disgenuine fairness to the executives at last mile providers: I don’t know how they will ever obtain a fair trial. Last mile telecom providers (especially cable tv companies) are unversally reviled by the public. Politicians and used car salesmen are viewed as saints compared to the cable company. Citizens will volunteer to be prison guards just so they can laugh in the face of the (formerly abusive) telecom executives. mostly agreed, but congestion is not the only factor in the investment… there are fixed costs related to the first/last mile infrastructure… however no one with the exception of VZW has invested anything here in the past 5-7 years (at least) by my reckoning..
As anyone who’s had to live with a tight cap on their residential service knows, caps are a burden. 250G a month is a pipe dream (bitter joke intended) for many Americans; I’m just 30 miles west of Ann Arbor and don’t have access to a wired ISP. Anyone with a family who’s had to suffer with satellite or 3G as their sole internet connection really doesn’t have a lot of sympathy for those who stream Netflix like turning on a faucet. We know the tricks — unplug the router. Unplug the modem at night. Stop all advertisements (are you listening, retailers?? ), block everything that’s not necessary. Avoid Youtube, how-to videos, and any site that’s graphics-intensive. If it’s cloud-based, forgetaboutit!!! No online gaming. Don’t even bother with Carbonite or other backup services. Watch your FAP-o-meter and get used to playing the role of “Grand Inquisitor,” trying to find out who downloaded a 1G file. That’s a full-time job with teenagers. People will learn to self-ration. They’ll hate every moment of it, and quickly learn to prioritize what they must have, what they want and what they can live without. Game developers who want to eliminate the sales of DVDs had better take heed and Steam had better get on board dealing with the consequences of caps before it’s too late. Stacy, don’t you think pressure should be put on the ISPs, and not innovative companies who are developing technology and optimizing it to adapt to many different bandwidth configurations? This is like having caps on power. No one wants it, no one is going to monitor their power usage, and people will grow increasingly upset. I’ve asked this a million times and never gotten a straight answer. Why hasn’t my default $45-50 a month Comcast internet gotten faster in the last 8 years or so? This isn’t Netflix’s fault for not educating users on how to live with caps. This is Comcast’s fault for not improving their networks to not have to impose caps. Caps mean their network is congested and they should be trying to improve it. Where has that improvement been since the 250GB cap was imposed? One way the local providers here do it is to put a bandwidth cap the moment you exceed your monthly data cap. As much as I don’t like caps, I think this is at least a fair way of managing people’s expectations and you’re not stuck when you go beyond the limit. The caps aren’t enough. The capacity of the networks should be far beyond that of the average user. Innovation has moved at the correct rate. The cable providers haven’t met them half way. It should have been their expectation in 2008 that by 2011 their networks should be able to support much higher caps, especially when in the past, there have been people who maxxed out ther 56k connections and people who just used it to check their email. I don’t think the usage patterns have changed, but I haven’t felt a jump like 56K to Cable in a long time. Cable’s still slow and faster internet is outrageously expensive and not worth it, given the caps. I only pay Comcast because they’re the only game in town, but I am in no way satisfied. It’s like Verizon. They’re the fastest, but they’re still not consumer friendly.